Wrinkles are not a reflection of death, annihilation; rather they are a sure sign of life. They represent aging which is still beautiful. 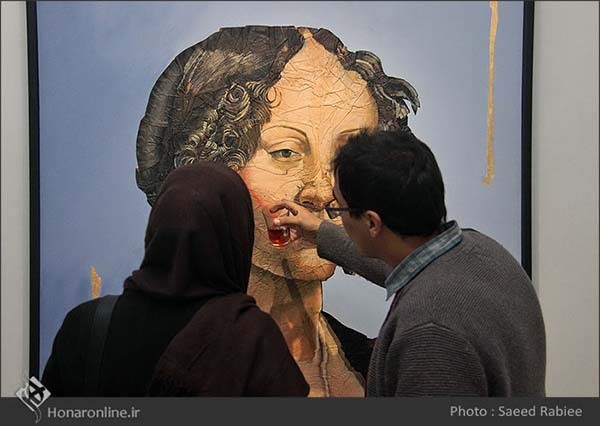 Portraits of figures dating back to the Renaissance have become the theme of a painting exhibition by Iranian artist Mohammad Hamzeh, who has taken a look at the magnificence of that era through an esthetic prism. He has tried to depict the past glory by means of creases that the passage of time has imposed on his subjects. The portraits have developed wrinkles and aged, but their nobility has remained intact. Instead of causing damage to the portraits, wrinkles help the artist inject fresh blood into the paintings and make them stage a strong comeback from the past. Mohammad Hamzeh is 51 years old. The exclusive exhibition which displays his wrinkled portraits painted through the acrylic technique is his 12th. Earlier, Tehran Museum of Contemporary Art and art galleries in New York and Germany displayed his works along with those of other artists.